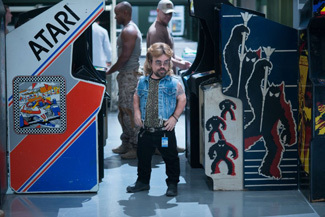 Kim Hollis: Pixels, the Adam Sandler videogame comedy, debuted with $24 million. What do you think of this result? Ben Gruchow: This has got to be disappointing for anyone in Sony's accounting department, and for good reason. From the accounting perspective: I might've seen the trailer once, a while ago; I haven't read reviews and don't really know anything about the movie's plot other than the fact that it has a giant Pac-Man, a giant Donkey Kong, and they're sent by aliens to do something bad, and that it hovers between 19% and 20% on Rotten Tomatoes depending on what time of day it is. Despite this, even I know that it stars Adam Sandler, Kevin James, Josh Gad, and Peter Dinklage. Your mileage may vary on how much you like each individual actor, but they're all well-known and they all have audiences or recent projects that overlap to a degree with this kind of release. An ensemble with the kind of conceptual hook that this one had should've easily overcome a 20% review score; the fact that it really didn't points to the idea that someone involved in planning and marketing screwed up badly along the way. The multiplier has me thinking that this is going to hit $60 million or so, but not too much more. Edwin Davies: This is at least a step up from Blended, last year's Sandler-led disappointment, but that's not saying much. Despite an interesting premise, one which seemed custom-built to draw out nostalgic parents who would be happy to bring their kids along for the ride, a decent cast and a solid marketing campaign (the trailers weren't great, but they sold the idea and there were plenty of tie-ins related to the movie), Pixels couldn't overcome audience fatigue with Sandler and the bad reviews. Clearly the trick of matching Sandler up with more popular, or at least less disliked, actors that kept Grown Ups 2 profitable didn't work so well this time around.